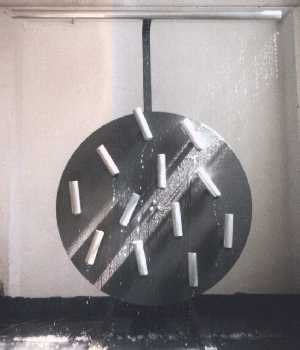 Twelve tubes are joined to a steel disc of 1.15 m diameter. Each is closed on one end with lead the opening consequently being moved to the top. Water is raining into the tubes. 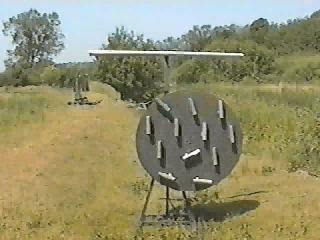 When their balance point reaches the axis, they start to topple, empty out, stand up again. 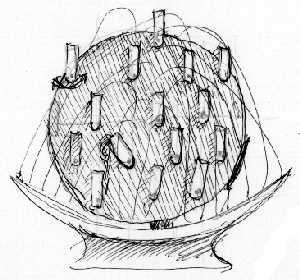 Thus the balance point of the whole disc keeps moving and the disc swings niddle-noddle. Apart from that the disc is hanging on a counterbalanced excenter ever rising and sagging it. 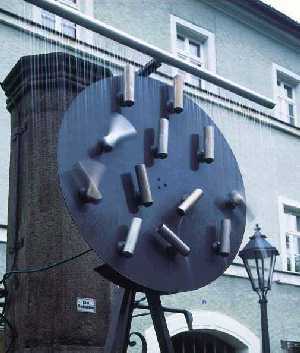 The movement is similar to that of the Chaosscheibe II. 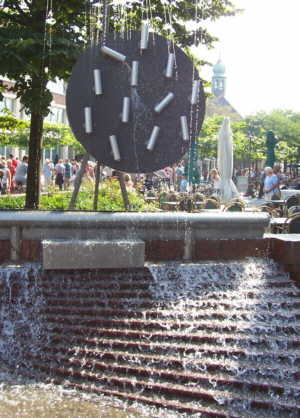 This sculpture was developed in cooperation with Roland Hermanns, being my partner also with the KippZylinder.